A union is trying to keep staffing levels up for their higher paid members. This has nothing to do with the union trying to protect patients. The opposite is true. This is about the union trying to protect jobs, regardless of the harm to patients. Though DuRee predicted that the increase in the number of units carrying paramedics would reduce medical call response time overall by about 40 seconds, critics say that two paramedics back each other up and can execute interconnected procedures at the same time, such as intubating a patient while beginning intravenous therapy, or provide care that an EMT cannot. How many medics are needed on a call? How much paramedic care needs to be performed at once? How much experience is lost by having that experience divided among more patients? I have highlighted some of the factors. 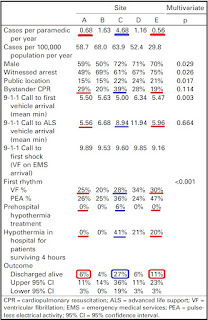 The service with the most cardiac arrest treatment experience per medic also had the highest rates of bystander CPR, and use of therapeutic hypothermia. The rate of VF (Ventricular Fibrillation) as the initial rhythm was not different. Even though it took 1 1⁄2 times as long for the paramedics to get to the patient (probably due to having a lower concentration of paramedics), the outcomes were dramatically different. 2 1⁄2 times as likely to be discharged alive compared to one system with much less experienced medics. 4 1⁄2 times as likely to be discharged alive compared to the other system with much less experienced medics. Significant variation exists among the cities even after known predictors of survival are controlled. A positive correlation exists between more cases treated per paramedic and survival to discharge. Whether that relationship is causal or a marker for some other factor(s) cannot be determined. What about having more medics on the scene to treat a cardiac arrest? 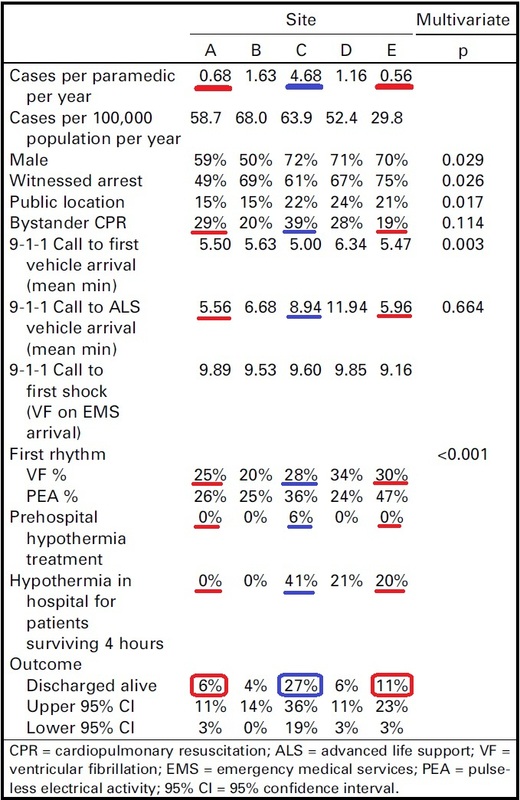 When adjusted for variables previously correlated with cardiac arrest survival and referenced against crews with two paramedics, patients treated by crews with three paramedics (0.83, 95% conﬁdence interval [CI] 0.70 to 0.97, p = 0.02) and crews with four or more paramedics (0.66, 95% CI0.52 to 0.83, p < 0.01) were associated with reduced survival to hospital discharge. Too bad they did not have a crew configuration of one paramedic with one basic EMT to compare with the outcomes for two paramedics, three paramedics, and more than 3 paramedics. How much worse do we make things by adding paramedics, who have protocols focused on treatments that do not work? Survival from cardiac arrest has increased as we have eliminated advanced procedures. If more medics means more ALS procedures, that is just another reason to oppose having more paramedics on scene. Pritchard turned around a comparison that has been used to promote the deployment model, saying that patients will get the same level of service for a stubbed toe as they would for a heart attack. “That’s an inefficient use of resources,” Pritchard said. Is that as bad as sending more paramedics to calls that do not require, especially when more paramedics probably make things worse? Has Pritchard ever been in favor of cutting union jobs to make the use of resources more efficient? 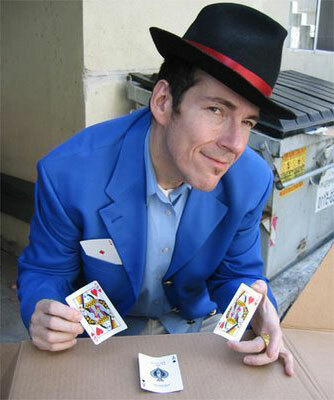 The longer this union representative delays improvements in patient care, the more power he has. More paramedics means less experienced paramedics. Michael R Sayre, Al Hallstrom, Thomas D Rea, Lois Van Ottingham, Lynn J White, James Christenson, Vince N Mosesso, Andy R Anton, Michele Olsufka, Sarah Pennington, Stephen Yahn, James Husar, Leonard A Cobb. Free Full Text Download in PDF format from Academic Emergency Medicine. The association between emergency medical services staffing patterns and out-of-hospital cardiac arrest survival. Eschmann NM, Pirrallo RG, Aufderheide TP, Lerner EB. Prehosp Emerg Care. 2010 Jan-Mar;14(1):71-7. Some good points made there, Rogue. More isn’t necessarily better, but this is a fact that isn’t always obvious to an outsider…or insiders, for that matter. Let’s hope that a proper, tiered system is given the preference. Sounds like the medics will be going to the engines that don’t currently have one- which means every call will still have two paramedics (minimum), and nobody is losing their jobs- even the EMTs will be going from the BLS trucks to the new single-medic trucks. So it’s not a budget-saver or better medicine. Not to play devil’s advocate, but doesn’t Wake County EMS have one of the best rates of survival to discharge neurologically intact? We send between four and six medics to every code, making us a significant outlier. Doesn’t Wake have P/B ambulances and 5 single medic APPs? How do you end up with 4-6 medics? Do you really send 4-6 medic units? Either way, you could get the same results with less medics. We have some Rescue Technician coesrus we run here in the Northeastern US pro-board coesrus. One of the things we tell our students is that we as instructors consider ourselves aspiring rescue technicians, meaning, you really never know it all, you should be constantly learning. A certification does not make you a rescue technician .